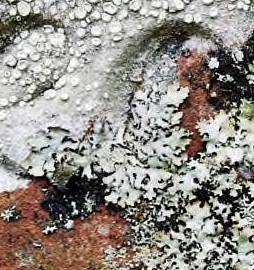 Lichen blooms over a red grave stone in the abandoned kirk yard in Anworth – a location for the filming of The Wicker Man. White rings have formed: crusted lilies mottling the memory of John Blain, who died on the 17th of June, 1896. They started long before Edward Woodward came and will continue to creep outwards for a years to come. These flowers could be made up of warts on sensitive skin but they are more beautiful and slow. A century-long spring.